You have added Overcast Floral Print Chiffon Belted Designer Maxi Dress into shopping cart. 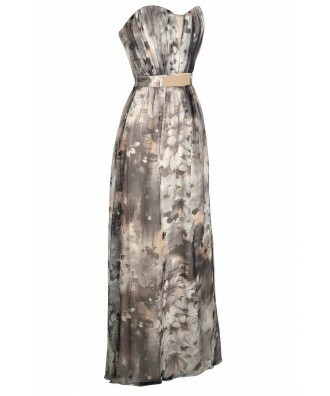 Absolutely stunning describes the gorgeous neutral floral print fabric of this chiffon maxi dress. 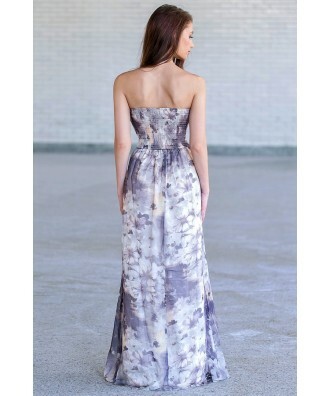 The Overcast Floral Print Chiffon Belted Designer Maxi Dress is made of a silky chiffon fabric with grey and ivory abstract flowers throughout. It has a strapless sweetheart neckline with a plunging dip in the front. Gathered fabric at the bust adds detailing to this look. The empire waist has a fabric belt with a silver band in the front, creating contrast. The full length maxi skirt is fully lined in ivory. Fabric ruching at the back of this dress stretches to fit. The Overcast Floral Print Chiffon Belted Designer Maxi Dress would look great paired with strappy heels and a clutch for your next event. This would be a cute dress to wear to a formal wedding. This is also a great feminine alternative for a prom dress. Details: Fully lined. Boning at bust. Belt included. Fabric ruching at back. 100% polyester. Lining: 96% polyester, 4% elastane. Hand wash only. Do not bleach. Do not tumble dry. Iron on reverse side. Do not dry clean. Size UK 8/US 4 measurements: Length from top of bust to hemline: 53". Bust: 33". 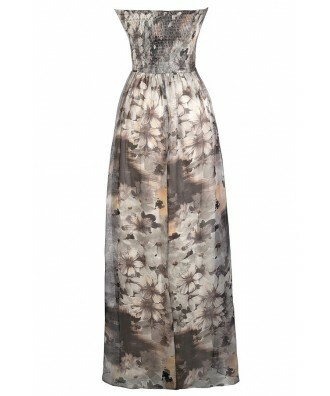 You have added Overcast Floral Print Chiffon Belted Designer Maxi Dress into Wishlist. You have added Overcast Floral Print Chiffon Belted Designer Maxi Dress for Stock Notification. 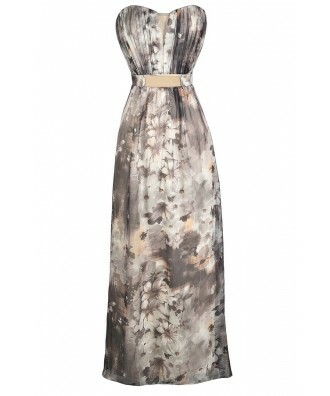 You have set Overcast Floral Print Chiffon Belted Designer Maxi Dress as a loved product. You have removed Overcast Floral Print Chiffon Belted Designer Maxi Dress as a loved product.